In our post Go All in For Jesus, we talked about the importance of giving God our whole heart, all our heart. The Bible repeatedly tells us to do things with “all your heart.” This means to not do things halfheartedly, that is with a split allegiance or divided focus. Instead we must do everything with our whole heart, not half way but all the way. This idea of doing things for God with our whole heart occurs in both the Old and New Testaments of the Bible. Half of them appear in Deuteronomy, but the most significant times are in the New Testament, quoting the words of Jesus, when he tells us to love God with all our heart, soul, mind, and strength. The most common thing we are to do whole heartedly is to love God. This is in both the Old and New Testament, first coming from God to Moses and even more importantly coming from the lips of Jesus. We must love God fully (Deuteronomy 6:5, Deuteronomy 13:3, Matthew 22:37, Mark 12:30, 33, and Luke 10:27). Another frequently mentioned instruction is to serve God wholeheartedly. This means we’re to work for him, to do things for him. When we do things wholeheartedly our actions become a witness to others of how important God is in our lives (Deuteronomy 10:12, Deuteronomy 11:13, Joshua 22:5, and 1 Samuel 12:20, 24). The idea of turning to God wholeheartedly shows up in three forms: turn to God (Deuteronomy 30:10), returning to God (1 Samuel 7:3), and return to God (Joel 2:12). This idea of turning to God ties in with repentance. When we think of repenting as making a U-turn to follow Jesus, we know that we must do so with our full heart. We must look for God, to go after him wholeheartedly. Jeremiah says that we if do this with all of our heart, we will find God (Deuteronomy 4:29 and Jeremiah 29:13). The Bible tells us things that we must do, which we must pursue wholeheartedly (Deuteronomy 26:16). The context refers to the Old Testament Law, but is that the extent of the instruction, or does it apply to the whole Bible. Connected with the idea of observing God’s commands is to obey them (Deuteronomy 30:2). Though this may be two words that look at the same action, is it possible to observe something without obeying it? One of the better-known verses about this subject is a proverb to trust God with every bit of our heart (Proverbs 3:5). If we trust God wholeheartedly, that means we aren’t putting trust in ourselves or our situation. We’re handing all our trust to God. Next we are to take hold of God’s words (Proverbs 4:4). In Proverbs, Solomon instructs his son, but in this verse, it isn’t Solomon’s advice. It’s God speaking to Solomon—and to us. We are also to praise God wholeheartedly, with happiness and joy (Zephaniah 3:14). This may be through our worship music, but even better is when it’s through our actions and our words in everyday life. 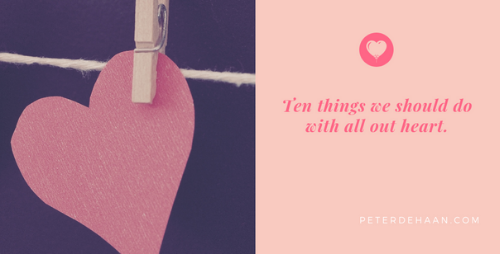 These are ten things the Bible tells us to do with all our heart, not halfheartedly but wholeheartedly. In doing so we honor God with our words and our actions. He deserves nothing less.